Firstly, it looks awesome. Pulling out a pistol squat in the gym makes people look over and wish they could do it. But that aside, pistol squats have so many benefits that most other leg exercises just can’t compete with. It is an extremely challenging exercise that requires very strong leg muscles, a high level of balance, and a good degree of flexibility. And because of the outward leg being used as a counter balance, you can really work the full range of muscle contraction. The barbell back squat, or squats of any nature, are commonly known as the king of exercises. This still holds true due to the many benefits it adds to an overall routine. The back squat allows you to add a lot more weight due to the greater stability in the exercise, so can be a great way to build the strength of the legs. The main problem with the back squat is that as your legs and glutes get stronger, the increase in load required, adds a lot of weight onto your back. This puts a huge vertical pressure on your spine, compressing your vertebrae. If you think about it, your legs and glutes are the strongest muscles in your body—at least they should be unless you’re skipping one too many leg days—and so expecting your upper body to compensate the weight needed to work them harder and harder can be dangerous without perfect form. It can lead to problems ranging from lumbago and muscle strains to sciatica and bulging or fully herniated discs. Pistol squats don’t have this problem. Doing unweighted pistol squats is more or less equivalent to doing back squats with your own weight added to the barbell. When you start to add weight to a pistol squat, there is some strain on the back, but more from a stabilising standpoint, and the weight needn’t be as high as that for a back squat. So when you master the pistol squat, you’ll not only be giving your legs the best workout they can get, you’ll also be working on much more. The added benefit of adding weight is that you don’t need to add much to get similar results to adding a lot on the back. 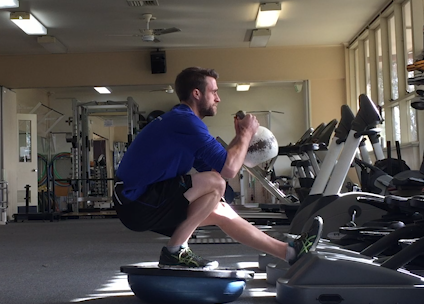 Like I mentioned, the pistol squat without any weight is essentially the same as back squatting your own bodyweight. Once you’ve mastered the pistol you can start to add weight by holding something in your hands, like a goblet squat. As previously mentioned, this is a great way to increase the strength needed to perform the movement with minimal risk of injury to the spine. For example, I weigh 66kg (I’m a cyclist so I need to be light and have strong legs) and I can pistol squat holding a 20kg kettlebell. That is like loading up my back with 106kg barbell of weights—almost double my bodyweight—and you’d have to make sure you’re going right down to the ground with your barbell back squat to match the range of motion. I’ll explain further for those sceptical. Someone weighing 80kg doing a back squat of double his weight would require a barbell loaded up to 160kg. This requires each leg to lift half his body weight (40kg) and half the barbell weight (80kg). So each leg is technically lifting 120kg each. For a pistol squat to match this, it would require the leg being worked to lift his entire body weight, which is already 80kg, plus adding a weight of 40kg. That leg is now working 120kg. Holding a 40kg weight is much less with very minimal risk to compressing the spine. Plus, you get all those added benefits. It’s hard to compare like to like, as there are numerous factors that come into play, for example the leverage caused by the extended away from the centre mass, the fact the legs have weight of their own to take into account, and the fact in a pistol squat you have the entire other leg to lift. Also barbell squats require less balance and flexibility so loading them up can be easier. On a side note, do not attempt to attempt to match your barbell weight straight into a pistol squat (even with the maths taken into account), as you will need strong back muscles to stabilise the back, it takes work to build up the added weight. Once you have mastered the pistol squat, then managed to add weight, your next method to increase the difficulty is doing a pistol squat on a bosu ball. Then adding weight again. Once you have mastered this, you can call yourself an elite exerciser. Pistol squats are a great addition to anyone’s workout, especially if you have issues with back squats, they can be a great substitute. For those that have no problems with barbell back squats, they are simply a great addition to a solid lower body routine, helping to even up any bilateral leg strength deficit. Great if you’ve had an accident recently affecting one leg, like myself.